French educator and writer; born at Colmar, Alsace, Aug. 5, 1853. He received his first education at the Jewish communal school of his native city, of which his father, Joseph Bloch, was director. Thence he passed to the lyceum, and after the Franco-Prussian war finished his studies at Paris. He became "agrégé des lettres" in 1881. After teaching at the Ecole Monge, he became director of the Ecole Bischoffsheim in 1883. He has acted as director and juror at several international expositions. He is a laureate of the Académic des Sciences Morales et Politiques, and an officer of public instruction. Bloch has written numerous reports, and lectured especially for the Société des Etudes Juives, which has published his addresses, including "La Femme Juive dans le Roman et dans le Théâtre"; "L'Œuvre Scolaire des Juifs Français"; "Les Vertus Militaires des Juifs"; "Les Juifs et la Prospérité Publique." Among his books for young people are "Les Mères des Grands Hommes" and "Epouses et Sœurs," which have been very well received and have passed through several editions (Paris, Delagrave). He is also the author of "Femmes d'Alsace" (Paris, Fischbacber), and has contributed to various Jewish and non-Jewish journals and reviews. 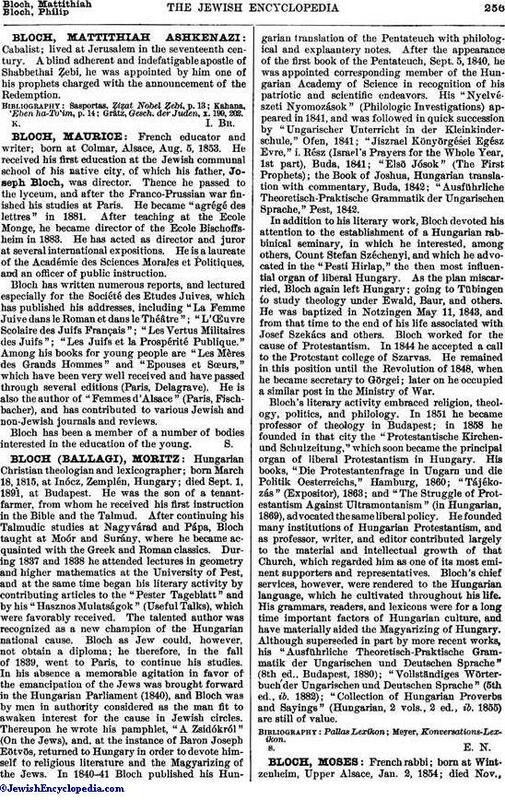 Bloch has been a member of a number of bodies interested in the education of the young.